There is an alarming rise in political killings and forced disappearances, which many people believe, involve Filipino state security forces. Since 2001, more than 830 deaths have been documented. Many more have not been counted. To date, according to the Children?s Rehabilitation Center, the death toll of children killed by the military during operations has reached 54. Seventeen children have been tortured, 69 illegally arrested, and 63 beaten and raped. The urgency of this situation has not been lost on many Canadians, Filipinos, and Filipino-Canadians in Toronto. And, the work of highlighting the terror being experienced by ordinary Filipinos today can benefit from strong international vigilance and continuing exposure of the situation. A group of local Filipino artists are coming together to raise money to help the children victims of human rights violations in the Philippines. 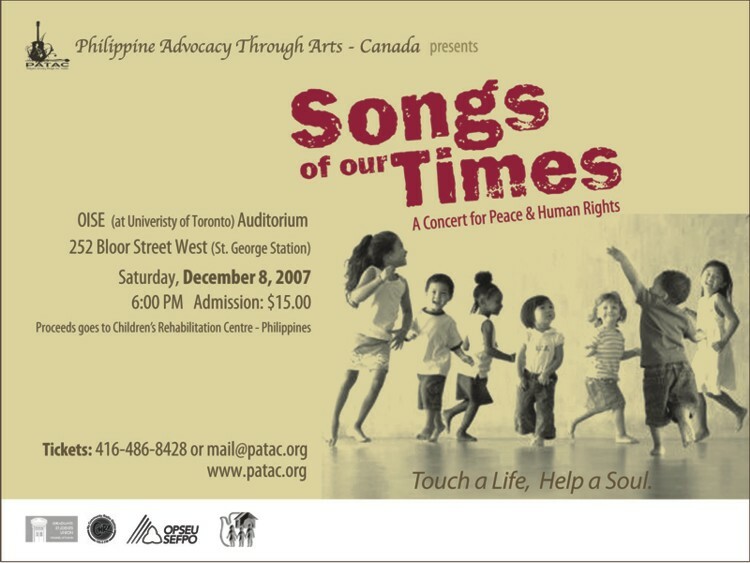 "Songs of Our Times, Touch a Life Help a Soul", a concert for peace and human rights, washeld on Saturday, December 8, 2007 at the OISE (Ontario Institute for Studies in Education at the University of Toronto) Auditorium, 252 Bloor St. West (at St George Subway) and raise $6000 which was given to the Children?s Rehabilitation Center (CRC) in the Philippines.